This boldly illustrated picture book has a different dinosaur poem on each page. Some of the poems are loud and noisy with lots of stomping and roaring and some are quiet and peaceful. Your child will love joining in with the strong rhymes and making up actions, the striking pictures give lots to talk about as well. Read aloud As you read the book aloud roar noisily with the dinosaurs and whisper for the mouse. 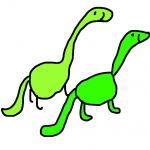 Allow time to talk about some of the pages, for example you could look for the dinosaur that is hiding together. Join in As you re read the book encourage your child to join in with actions, stamping their feet, chomping, and pretending to swish a tail or dive into a swamp. Roar, roar, roar, roar! I’m a roaring …………..! Talk about the book The pictures are so striking it is worth spending time talking about some of them. For example, you could ask your child which page is their favourite, what is happening in the picture and why they chose it. The picture of the two dinosaurs who are ‘just sitting’ is an interesting one to discuss, look at this together and talk about what you see and think. 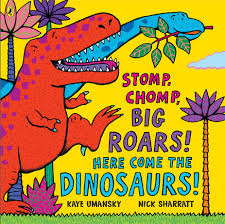 Stomp like a dinosaur – as you walk around the house or garden stomp like dinosaurs saying the rhymes as you go. Wearing big boots for this would be fun! Sand play – if you have access to a sand pit at home or at the local park your child could re create pages from the book with their toy dinosaurs (or other small toys pretending to be dinosaurs). Water play – the toy dinosaurs can join your child in the bath and dive in as if diving into a swamp while you repeat some of the rhymes again. More outdoor play ideas – find a space, or even better somewhere with a gentle slope, so that your child can roll like a dinosaur. Play dinosaur hide and seek. You can make a simple dinosaur puppet with your child from a fairly long sock. Felt would be ideal for eyes, teeth and spines but you could use other materials such as buttons for eyes and coloured cellophane for spines. Watch the video here for more ideas. Yo,Ho, Ho A- Pirating We’ll Go! See more about dinosaur themed activities here.